Are you having a hard time selling more of your products and services? Is there a part of you that doesn’t even WANT to “get better at sales,” because the whole thing just makes you a little bit queasy? If so, I’ve got some radical ideas for you about where this queasiness comes from – and some easy solutions for how to get over it. 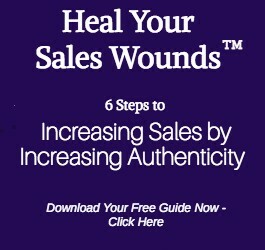 These ideas are part of what I call Sales Wounds™, and I’m writing about them in my upcoming book, Heal Your Sales Wounds™. 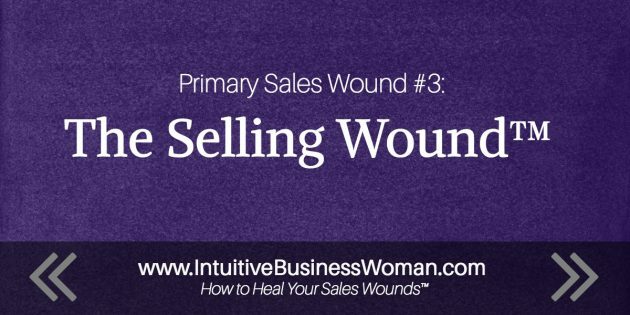 This article tells part of my personal journey with sales & Sales Wounds™, and also takes a deep look at where primary Sales Wound #3, The Selling Wound™, comes from. As a speak-to-sell stage presenter, I was always one of the top closers at any seminar I spoke at. I got so incredibly good at closing sales, I used to brag that I could sell snow to an eskimo. And thus began a journey that has culminated in my newest body of work & the book of the same name, Heal Your Sales Wounds™. What I had stumbled upon was the idea that sleazy salesmanship – ie, selling snow to eskimos – is nothing less than an abuse of power. And I began to realize that this was at the core of so many people’s resistance to selling and salesmanship. As an effective salesperson, I had a tremendous amount of power. I could get people to buy things, even things they didn’t want, even things that might actually harm them. While I never actually DID that, I could have. What I’ve now come to understand is that it’s this very possibility – that being good at sales gives you theoretical power over people, a power to harm people – that makes so many people resistant to selling. And while this is certainly true when we’re in the role of the consumer, it’s also true when the tables have turned and we’re in the role of salesperson. What I mean by that is that most of us – when we step into the role of salesperson – fear that we have now become the pushy, obnoxious & rude stereotype who we so detest. Or at the very least, we fear that that’s how other people will perceive us. What this means for business owners is they don’t do their marketing on a consistent basis. Their newsletter goes un-written, their follow-up phone calls get un-made, those prospect emails go un-sent. What this means for professional salespeople is that they under-perform. They go into slumps. They seek out “motivation” that might work for a while, but eventually it wears off & they’re back where they started. Classic sales coaching will tell you, “Feel your fear and do it anyway.” In other words, keep pounding that phone – eventually somebody will say yes! I say that’s TERRIBLE advice. Instead, you need to figure out who are the people that most want to talk to you, and why do they want to talk to YOU? Once you’re aware of the way that you’re authentically helping or offering a solution to the person you’re calling, it becomes much easier to pick up the phone. If this sounds like the old familiar “offer solutions to your customer’s problems,” trust me – what I’m talking about is not as simple as that. Another option is to schedule a Sales Wounds™ Interview with me. It’s a 45-minute conversation in which I help you to see your particular Sales Wound™, and also give you specific steps to begin to heal it. I’m only doing these interviews while I’m finishing up the book – some of them are giving me great case studies! So if you’re interested, sign up now. They’ll be gone soon.